One of the most important things that you can do, as a homeowner, is find a reputable Simsbury roofing contractor to work with. It is inevitable, at some point you are going to need the expertise of a professional as well as services that could range from new roof installation to storm damage repairs to complete roof replacement in Simsbury, CT. 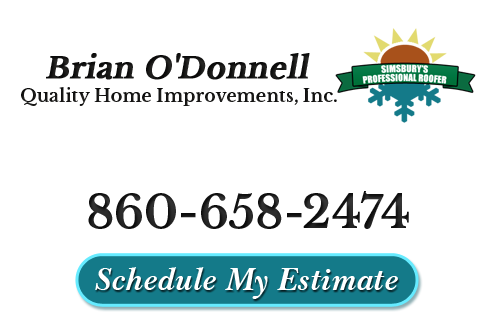 In fact, stay in the same place long enough and you are likely to need all of these services which is where Brian O'Donnell Quality Home Improvements comes in handy. Having been around since 1978, it is no wonder that Brian is considered the local leading service provider for residential roof and skylight services. Of course, the only way to last this long in the business is by providing customers with the exceptional service and results they need. Brian began his company almost 40 years ago and has been living and working in the Simsbury community ever since. We is well known for his honesty, knowledge and willingness to provide the very best solutions for each customer. This tactic works every time as opposed to a high pressured sales pitch. We are able to offer a variety of essential roofing services in Simsbury, CT in order to help you keep your roof in tact. Keep in mind, your roofing is the most important aspect of your home. This is what helps protect the entire rest of your structure, keeping it safe from the elements. Brian also has quite a number of personal and professional accomplishments that make him and our team of Simsbury roofing contractors the perfect choice for your work. For instance, he is a CertainTeed Select Shingle Master, a Charter Member since 1998. He has given back to his hometown through countless hours volunteering as a Scout Master with the local Boy Scouts, coaching hockey and attending countless sporting events and activities with his three children. The bottom line is that Brian is dedicated to this community, from the work that he does professionally to his personal free time activities. The crew that works behind his shares the same views and we have all been through extensive training and experience in the field. Don't settle for less than the best when it comes to the service you get for your roof and skylight. The good news is that we can take care of your skylights as well as roofing. From installation and repairs to replacement or straight up removal. A skylight can be a wonderful addition to any home, as long as the work is carried out correctly. There are of course things that can go wrong like the flashing, too much sun or just shoddy work from another roofer in Simsbury, CT. We will work with you to ensure that this doesn't happen or that problems you experience as the result of someone elses work can be fixed. Call today to get the work done that you need. "WE LOVE OUR 3 SKYLIGHTS – JUST LOVE THEM!!! The man who did most of the installation – Gene – was just terrific! The installation went perfectly and everything was cleaned up – just as Brian said it would be. Our house is now so bright that during the day we don’t need to turn on the living room lights. The shades work well and we still have fun "playing" with them. Should Brian ever need a recommendation from us, please have him use our name. We are so happy with what he helped do for us." "Dear Brian – Thank you so much for the time and effort you graciously gave to our serious ice dam problems. I picked you to do the work because you answered all my questions before I asked them. No other contractor ever mentioned the attic and you went up there to see what was happening. Your team that did the work were true professionals, too. Arriving on time, working all day, keeping me posted on the status of the job and cleaning everything up every evening. Please thank them again!" If you are looking for a professional Simsbury roofing contractor then please call 860-658-2474 or complete our online request form.